Most of the arrangements that CPC sets up with suppliers are EU-compliant purchasing frameworks. A purchasing framework is an 'umbrella agreement' that sets out the terms (particularly relating to price and quality) under which individual purchases (call-offs) can be made throughout the period of the agreement. Compliance with EU regulations is a consideration when the cumulative value of the purchases is likely to exceed a financial threshold set by the EU. CPC consults its members to find out what goods or services are required, and whether the total spend is likely to exceed the EU threshold - £181,302 for goods and services, £4,551,413 for the procurement of works and £615,278 for the procurement of a specific list of services found in Schedule 3 of the Regulations. CPC, with assistance from its members, develops a specification and researches the supplier market for the commodity or service in question. CPC carries out a competitive tendering exercise in compliance with EU Public Sector Procurement rules, inviting tenders from all suitable suppliers. The tender specification sets out how the framework will be accessed by CPC members. A supplier or (more usually) a panel of several suppliers is selected, based on a number of criteria including price, quality and service. CPC then writes a User Guide that explains to members how to use the framework. CPC manages and improves the performance of the framework throughout its life. FE institutions can then access the framework for their individual purchases (call-offs). 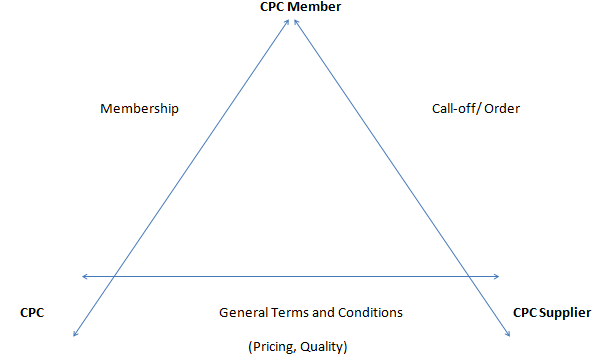 Only then is a contract formed; the contract is between the supplier and the institution (not CPC). The method of access varies from framework to framework. It can be a relatively simple matter of comparing price lists and selecting the cheapest. For more complex requirements the institution might need to define its requirement then invite all suitable suppliers on the framework panel to submit their prices. The panel of suppliers has already been vetted and approved, so the institution can be assured of the supplier's quality and capabilities. Every supplier has had to go through an EU-compliant competitive process in order to be appointed to the panel, ensuring that prices are as keen as possible. Where a panel has more than one supplier, the suppliers are engaged in constant and repeated competition for business throughout the life of the framework, which tends to keep them on their toes! CPC makes the buying process for each framework as straightforward as possible, and the process is clearly explained in a User Guide. The framework consolidates the purchasing power of lots of individual institutions, resulting in better prices and service. The institution can rely upon CPC's advice, expertise and collective muscle when it experiences problems with suppliers.